Marilyn Monroe filmed River of No Return in the Canadian Rockies at Alberta’s Bow Valley. It was her first western and during filming she twisted her ankle during a scene in the river, bringing Joe DiMaggio to her side as she hobbled around on crutches. Some say the injury was Marilyn’s way of getting back at director Otto Preminger, with whom Marilyn didn’t get along. The photos were shot by John Vachon, on assignment for LOOK magazine in Alberta, Canada, where Monroe was filming River of No Return with Robert Mitchum. 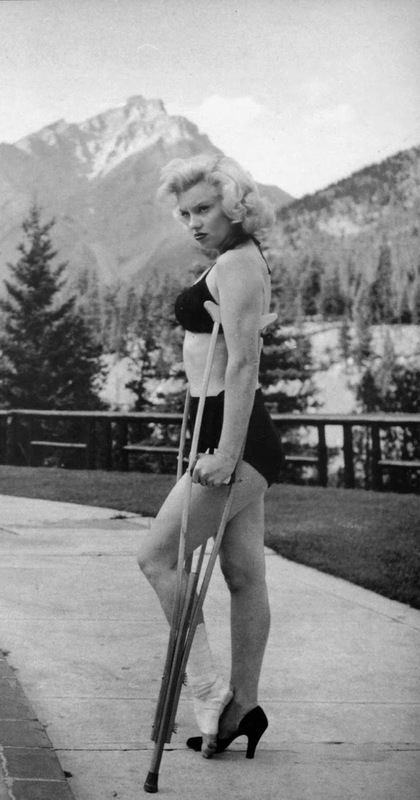 An injured ankle prevented Monroe from filming, allowing Vachon to have several days to shoot the Hollywood icon. Vachon’s lens captured her in a variety of contexts and countenances. 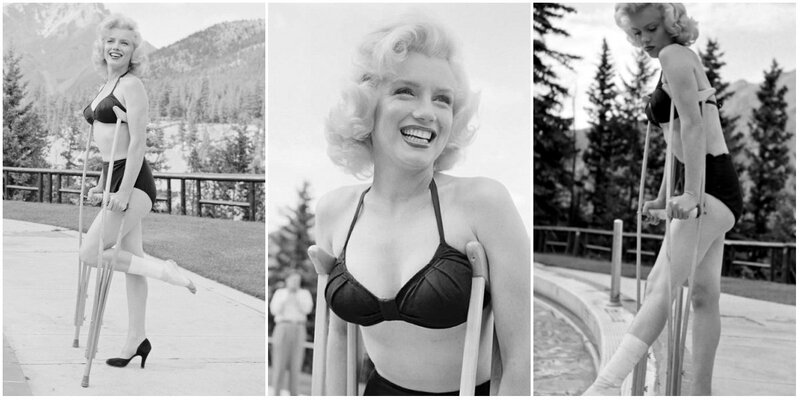 Here is Marilyn the way we want to remember her: luminous, sexually charismatic, smiling radiantly — even on crutches. This extraordinary portfolio of revealing images ranges from her mugging poolside to riding high on a ski lift to nuzzling with her then-husband-to-be, the legendary Joe DiMaggio — the only time that the two posed formally together for a photographer. These are the pictures of Miss Monroe that were taken for LOOK magazine in 1953, but only three from the album made it into the final edition. The remaining negatives have been hidden away – until 2011.